In the world of trading, it is not just gaining profits that should be the goal of many traders and investors. One important goal that many people tend to neglect or fail to develop is the strategy to minimize losses. That is why it is also quite essential for traders and investors in any type of market to be able to develop certain exit strategies that not only will help preserve their profits but also help minimize those costly losses when worse come to worst. An exit strategy is simply a plan that will allow an investor or trader to get out of a certain investment or trading situation based on a set number of factors and indicators. The exit strategy is basically used to help one to leave a certain situation after a predetermined goal has been reached or help one avoid further losses. It can either help an investor or trader post an achievement in the market highlighted by the profits earned or help one from going into further embarrassment and failure in the market. Basic exit strategy terms you should know. When it comes to exit strategies in any type of market, there are certain terms that are commonly heard- the take-profit and the stop-loss orders. These terms usually refer to a type of exit being made. The Take-Profit (T/P) or limit orders are market orders that can be placed instructing a broker to sell equities automatically when it reaches a certain high point or price. Take-Profit orders usually set an exit point that is usually set above the current market price of the equity to ensure that profits are preserved when the exit order is made. Stop-Loss orders or stops are similar to T/P orders but work the opposite way. While Take-Profit orders take into effect when a security has obtained a specified amount of profit. Stop-loss orders are called when prices of a certain security begin falling towards a certain specified price. While T/P orders preserve profits, stop-losses aim to minimize losses. 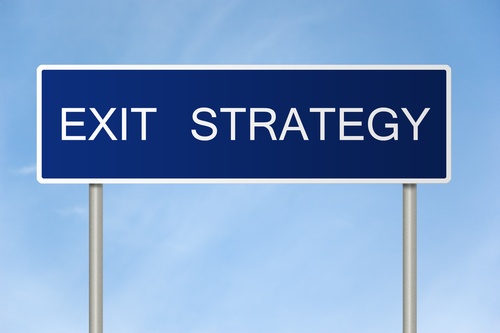 When developing an exit strategy, there are some thing that a trader or investor should be considering. It includes setting up the length of time that one plans to stay on a certain trade before letting go of it. Another thing to consider is the risk that is involved and how much risk one can tolerate or is willing to take. Still another thing to consider is at what instance one may prefer to get out of a certain trade. These considerations may help one in developing a clearer and better exit strategy that will help them survive better in trading. A good exit strategy may be the main basis on whether one becomes either a failure or a success in the colorful and unique world of trading and investing.